Epic Rap Battles of History is a comedy series on Youtube that produces rap battles between historical and fictional figures. Created by musicians EpicLLOYD and Nice Peter, the show features incredible rhymes, and hilarious music videos. The series often takes characters that are similar or share a similar title and pits them in a rap battle of wits against each other. This particular track takes the two greatest detectives in literature, Batman and Sherlock Holmes, and has them spit some hot fire. Batman is played here by Nice Peter, co-founder of ERB, and Peter portrays him much like Christian Bale’s Batman from The Dark Knight. This means he raps in Bale’s raspy, growling voice from the movies. Sherlock Holmes and his partner Dr. Watson are played by Zach Sherwin and Kyle Mooney, and they don the appropriate British accents for their verses. The beat is pretty sparse and dark, which fits well with the dark and gritty crime world of Batman. It gives the impression that Batman has homefield advantage in this battle. There are plenty of great one liners in this video from both sides, but Holmes’ closer about how beating the Dynamic Duo was “Elementary, my dear Watson” was a killer line that may have sealed his victory. 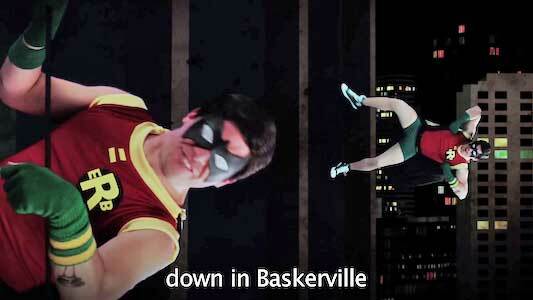 ERB parodies how the classic 1960’s Batman TV Show had Robin climb buildings. 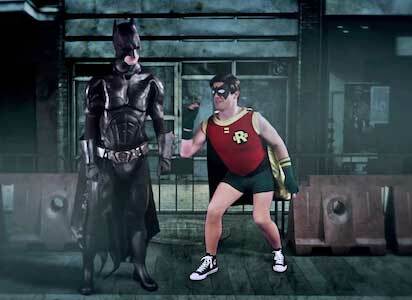 The video has Batman dueling Watson and Holmes from his perch on a Gotham skyscraper (complete with Batsignal) as they stand on a cobbled London street. Watson is Sherlock’s hype man throughout the video, standing at his side. Batman says his sidekick only arrives when he’s needed, and that’s the Boy Wonder’s cue to step in with some rapid fire rhymes. Robin’s decked out in his classic 1960’s attire, but instead of little boots, he’s wearing green Chuck Taylors. The music video’s pretty funny, and has some good visual gags. It also helps the song put visuals to some of the witty rhymes, which definitely aids the comedy aspect. 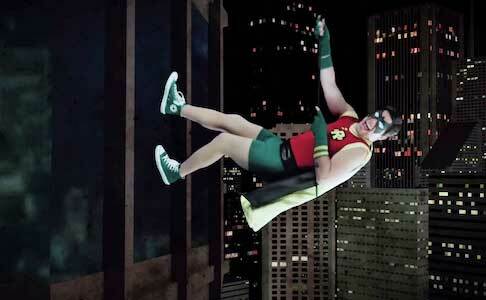 Robin (played by EpicLLOYD) wears green chucks in this video. Get yourself a new pair of chucks to save the world in by clicking on the links below.